We did the research to find the best sleeping bags made in the USA today. Below are our top recommendations, along with a ton of details about each one, and an in-depth look at the factors we considered in our research. After looking closely at many different sleeping bags produced in the USA, we narrowed our list down to the top six products available. A couple standouts: We were particularly impressed with the insulation used in the Wiggy’s sleeping bags during this testing process because it doesn’t compress as much as down insulation does. We were also impressed with the sheer durability and warmth provided by the Wester Mountaineering Puma bag. We have a ton of detail on those two brands and several others below. We broke our top picks into several different categories, which hopefully makes it easier for you to find the right one. Below are deeper details on all of our top recommendations, along with what we liked and didn’t like about each one, and where to get them. We were impressed with the Merlin 30 YF sleeping bag from Feathered Friends because of how lightweight and warm the product is. It’s designed for hiking and can be carried around comfortably even on long trips. 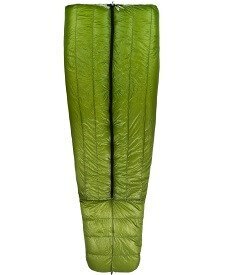 This sleeping bag uses the traditional mummy design, and will keep you warm down to 30 degrees Fahrenheit during use. The bag utilizes a tough Pertex Y denier fabric that’s rip-resistant for maximum strength. The outer shell is treated with a waterproofing layer to help keep you and the bag filling nice and dry throughout the night. The sleeping bag is also filled with power goose down and is designed to keep nice and fluffy during repeated use to help you remain warmer. It’s sold in two different color finishes and lengths and is a solid hiking bag for the cooler (but not too cold) nights. Zpacks is a well-known brand that made our list for its excellent construction quality and the good blend of features that goes into this classic sleeping bag. This bag goes to great measures to offer proper insulation for comfort during cold conditions. It packs in 30% more down insulation than is necessary to keep you warm at those temperatures to account for compression over time. We love how the bag keeps the insulation locked in position using narrow chambers. 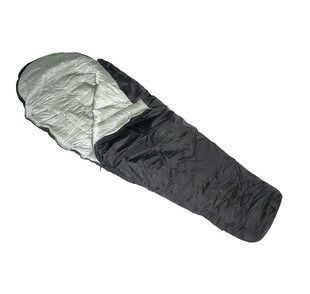 This sleeping bag relies on a tough ripstop nylon material for the inner liner and the outer liner. It’s also coated with a water repellant inside and out for long-term performance. It features an elastic cinch for a nice tight fit around your neck during use to keep body heat in. When you’re not using it, be sure to store it loosely and let it breath to help prevent further compression of the down insulation inside. As we mentioned above with their Merlin bag, Feathered Friends is a tough American brand that’s known for producing sleeping bags that hold well over time. The Snowbunting EX 0 bag is no exception – it’s a durable and lightweight product that’s designed to keep you nice and toasty in cold temperatures. This sleeping bag comes stuffed with a high quality 900+ Goose down material that maintains its loft nicely after several uses. The bag is designed in the standard mummy shape and features a wrap around hood for added warmth for your head. The bag is made from a tough Pertex material and uses a mix of 15 denier and 40 denier rip-stop fabric for strength while keeping weight down. This bag weighs less than 3 lbs. whether you get the standard or long variation. It comes with a convenient stuff sack and a storage bag and makes an excellent hiking companion in cold weather conditions. This sleeping bag is costly, but it’s built to last and will work well in most extreme conditions, making it a good asset for mountain camping and expeditions. With near legendary status amongst cold-weather hikers, it’s no wonder that this Western Mountaineering bag rose to the top of the competition in our research. It’s designed for impressive warmth and is rated down to -25 degrees Fahrenheit to provide warmth in even extreme sleeping environments. This sleeping bag offers 9.5” of down goose insulation loft. It relies on two layers of interlocking channels to hold the down in position, and has a side baffle for enhanced down control as well. This bag is offered in the Mummy configuration and offers a top hood to help keep your head warm during use. The whole bag relies on a lightweight MicroLite XP fabric that’s breathable and waterproof at the same time. The whole product weighs less than 4 lbs. and can be carried comfortably while hiking. It’s a tough bag that you’ll come to rely on for extreme sleeping conditions. Hikers looking to customize a sleeping bag to meet their sleeping conditions exactly, will love the options available with the Enlightneed Equipment Covert Custom bag. We love how many different size options there are to choose from when designing this sleeping bag from the ground up. Choose from five different lengths and four different widths for an excellent body fit for nearly everyone. You can also choose from a whopping 19 different exterior colors and 12 interior colors for exactly the look you want. “We offer 63,840 different possible combinations for our Convert alone,” says Tim Marshall, founder of Enlightened Equipment, who we had the pleasure of hearing from this week! Tim also mentioned that manufacturing locally is core to their product offering: “Manufacturing in the USA is the only way we can offer this wide variety custom products. This enables our manufacturing to be nimble and quickly adapt to changes.” This sleeping bag also utilizes 850 or 950 down insulation material and it can be customized for between 50 degrees and -10 degrees Fahrenheit depending on your sleeping conditions. If you’re particular about your sleeping bag specifications, give this option a look. When searching for an affordable sleeping bag that will still hold up well over time, sleeping bags sold by Wiggy’s make sense. These bags are lined with a unique Lamilite insulation that’s been show to maintain its loft even better than traditional down insulation does. These sleeping bags are rated at different temperatures from as high as 50 degrees Fahrenheit down to subzero temperatures. They are available in many different sizes, colors and types. We were impressed by the low-cost options available, especially for closeout sleeping bags from Wiggy’s. If you’re looking for an affordable bag to take hiking, Wiggy’s has a good range of options to look through. The most important consideration by far when choosing a sleeping bag is the insulation it comes with. We looked closely at the insulation for a few different things. We looked to see how well the bags maintain their loft through long-term use as well as the total loft offered for the temperature rating. We also looked at how chambers are used to keep the insulation uniformly positioned during use. By looking at loft tests and trying out the product ourselves we carefully determined just how well that insulation is going to keep you warm, and how long the insulation is going to continue doing its job properly after purchase. A good sleeping bag prevents moisture from reaching the insulation and affecting its performance in any way. We looked closely at the shell material used on the bag to verify that it’s moisture resistant and rip resistant as well. We researched each bag to make sure it holds up in rough conditions and performed well against a rip test on the inner and outer material, and a moisture test to see just how well each bag is going to keep you dry and protected during use. Every sleeping bag is weighted during the testing period to make sure it’s easy to carry in your backpack. However, we were also careful not to lean on this factor too much because a bag that is too light may not provide adequate insulation. A good sleeping bag shouldn’t weigh any more than 5 lbs. to be comfortable to carry around. Price is one of the last things that we looked at, but after verifying that a sleeping bag will work effectively to keep you warm and comfortable while sleeping, we looked at the actual cost of that bag when compared to other similar products. Price is used to help eliminate sleeping bags that are unnecessarily costly, and to help rule out sleeping bags that don’t offer the same quality and feature set as other bags. It’s important for a sleeping bag to fit well. When evaluating sleeping bags we looked at how many different length and width options are offered with each product. The more lengths and widths available, the better fit you can have with your sleeping bag.